Published: Dec. 12, 2013 at 12:14 p.m. 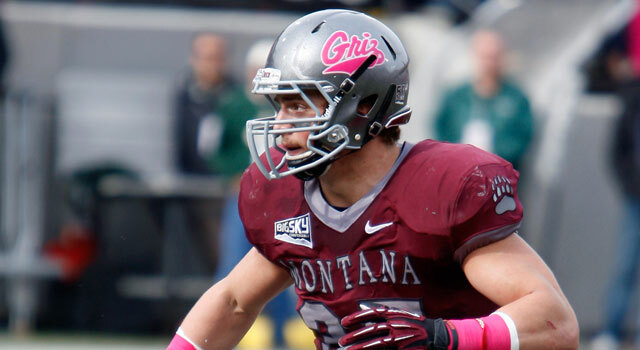 Updated: Dec. 12, 2013 at 12:21 p.m.
Montana LB Jordan Tripp has the size and speed to be a second-day draft pick, according to Gil Brandt. There are always a handful of players in the NFL draft who make people say, "Who's he?" when they get picked. A lot of times these players come from the smaller, lesser-known schools in the FCS, which obviously don't receive as much national exposure as the bigger programs in the FBS. This weekend, the FCS playoffs head into the quarterfinal round, and it's another chance for the players to get noticed and improve their stock in the draft, but it's also a chance for scouts and NFL teams to get a closer look and evaluate the players against higher-quality competition. The knock on FCS players, of course, is that they were not major college recruits, probably because they weren't fast enough or strong enough, and that's why they're in the FCS and not one of the bigger programs. They're good football players, but the quality of play, especially when you observe the overall team speed, generally isn't up to the standard of the FBS schools. Still, this season alone, nearly a dozen FCS schools have wins over Div. I-A teams, including North Dakota State's win over Kansas State and Eastern Washington's win over Oregon State, both of which happened the first week of the season. There's talent to be found here. Here's a look at a few FCS players you might not have heard about but have a good chance to play in the NFL soon. The majority of them are seniors, with a couple of underclassmen from Eastern Washington sprinkled in, and you'll have a chance to see a few of them who are still alive in the FCS playoffs this weekend. » Jimmy Garoppolo, QB, Eastern Illinois: Garoppolo (6-foot-2 1/4, 222 pounds) is ranked No. 40 in my Hot 100 senior prospects, and I recently put him in my second tier of QBs expected to be available in the 2014 draft, along with more popular names such as AJ McCarron and Aaron Murray. Garoppolo had a big game last week against Tennessee State, with 240 passing yards and three touchdowns. He has a good chance to be drafted on the second day, in either the second or third round. » Jordan Tripp, LB, Montana: Tripp is expected to play in the East-West Shrine Game next month and also has a chance to be a second-day draft pick. At 6-2 7/8, 235 pounds with a 4.65 40, he has size, speed and toughness. He will probably need to play outside linebacker in the NFL. Take a look at these players from small schools who are making a big impact in the NFL. » Daniel Kistler, OT, Montana: Kistler has good size at 6-8, 315 pounds, and very long arms, but he doesn't have enough quickness in his feet to be a left tackle; he will probably be drafted as a right tackle. » Zachary Bauman, RB, Northern Arizona: A four-year starter, Bauman is a shorter running back (5-8 1/2, 194), but he has been a very productive player, including a 266-yard game against Idaho State in October. He has good but not exceptional speed. » Marcus Williams, CB, North Dakota State: With his size (5-10, 198) and speed (4.5 speed), I think Williams has a pretty good shot to make it as an NFL cornerback. He's a good tackler, and he can play in space. » Kendall James, DB, Maine: James is not very big, but he has good coverage skills and very good speed; he was clocked at 4.35 in the 40-yard dash. Maine has produced a handful of players who've gone on to play well in the NFL. » Todd Washington, DB, Southeast Louisiana: Washington (5-11, 186) isn't quite as physical as Robert Alford, a Southeast Louisiana alum who was drafted in the second round by the Atlanta Falcons in April, but he shows a good ability to break on the ball and is a pretty good backpedaler. » Cqulin Hubert, LB, Southeast Louisiana: A transfer from Texas Tech, Hubert is better against the run than he is against the pass. He is 242 pounds and could play middle linebacker in the NFL, but there's some question whether he'll be fast enough to cover in space. » Tim Flanders, RB, Sam Houston State: A transfer from Kansas State, Flanders had his signature game this season against Texas A&M, rushing for 170 yards and two touchdowns and adding a receiving touchdown in the loss. He will play in the East-West Shrine Game. » Cooper Kupp, WR, Eastern Washington: A redshirt freshman, Kupp broke several FCS receiving records this season, including most TDs by a freshman (20), a mark previously held by former Marshall receiver Randy Moss. Kupp has scored a touchdown in every game he's played this year. At 6-2, 195 pounds, he's a good-sized receiver. His dad and grandfather both played in the NFL. » Vernon Adams, QB, Eastern Washington: Just a sophomore, Adams throws the ball very well and has had a nice season, passing for more than 4,000 yards and 50 touchdowns. He lacks size, however, at just 6-0, 190 pounds. » Gavin Ellis, Jacksonville State, TE: Ellis has very good size (6-6 5/8, 248) with 4.75 speed and has skills as both a passer and blocker.